Dozens of people in have died in the Philippines as a result of Typhoon Mangkhut at the weekend. Local reports described wind speeds of 205 kilometers (130 miles) per hour from the storm- known locally as Typhoon Ompong, which is the strongest tropical cyclone in any ocean basin this year. 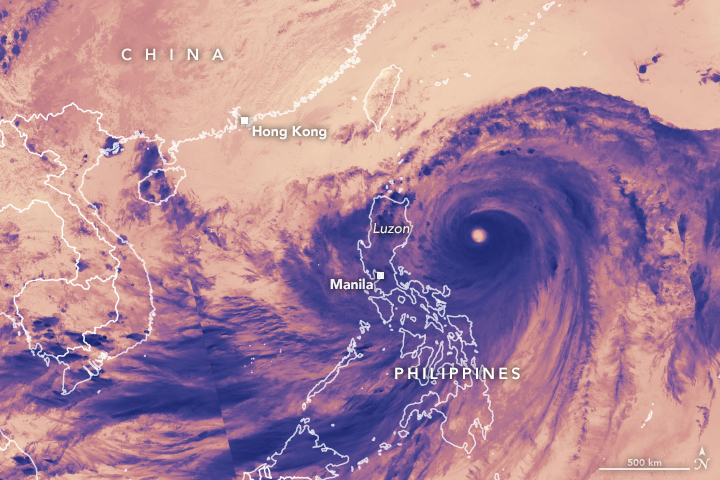 With an eye 50 kilometers (30 miles) wide, the typhoon stretched nearly 900 kilometers (600 miles) across. To date 65 deaths have been confirmed in the Philippines – with dozens more still missing, there are fears that the death toll could rise further. Most of the deaths there were caused by landslides – at least 33 miners died after being buried under a landslide. The typhoon, has also caused further deaths as it makes way inland across southern China – including two people killed in the Chinese province of Guangdong, where more than 2.5 million people have been evacuated. In the USA, large parts of the East Coast have been hit by heavy wind, rain and floods where a number of deaths have been linked to Hurricane Florence. The storm has forced the evacuation of thousands of people who have sought refuge in emergency shelters as storm Florence made landfall in the states of Virginia, North and South Carolina. While the hurricane has now been downgraded to a tropical storm there are fears of more catastrophic flooding as water levels continue to rise further.